If you’re looking for the highest quality grape picking scissors to harvest your fruit, the ARS-320-B-T tool perfectly fits the bill. 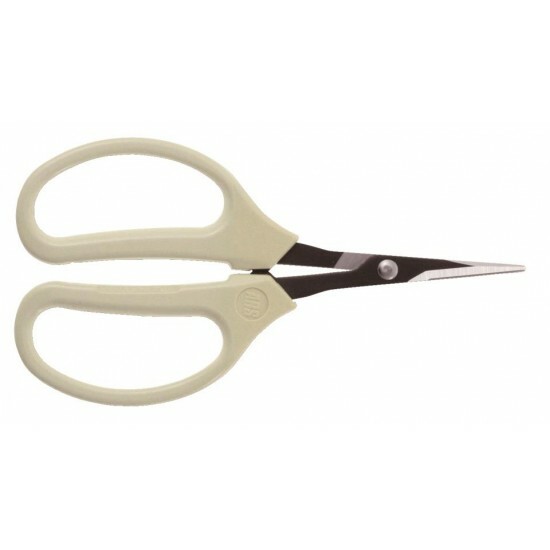 Manufactured by ARS, a leading brand in the cultivation industry, these scissors are not only strong and resilient, but they are also highly functional for long-term use. Featuring straight blades to allow for easier harvesting, these scissors are super-sharp for greater user-friendliness and faster cutting on flat surfaces. The sharpness of the blades is also retained in the long term allowing for greater productivity and low maintenance requirements. The strong, straight blades have been manufactured using excellent quality durable high carbon steel while the handles boast an ergonomic design which not only allows the user to have even greater control during continued usage, but also optimal comfort. The well-designed white plastic grip will fit perfectly in the user’s hand, ensuring no pain even when used all day. As an added benefit, the ARS-320B-T grape picking scissors are easy to keep clean and to sharpen, and you can be sure that it has been designed to protect your fruit throughout the harvesting process. Thanks to their short length and lightweight construction, they are also easier for gardeners of all kinds to use.